To start using AcquireIO iOS SDK in your project, add one of the following lines to your Podfile according to the version which you wish to integrate. For more detail, you can also check out our generated iOS docs or review the app store and source code on Github. The steps below use CocoaPods to integrate the AcquireIO SDK. For issues installing CocoaPods, see their website for help. First, Download AcquireIO iOS SDK. In iOS 10, Before you access privacy-sensitive data like Camera, Microphone, and so on, you must ask for the authorisation, or your app will crash when you access them. Open the file in your project named info.plist, right click it, opening as Source Code, paste this code below to it. Or you can open info.plist as Property List by default, click the add button, Xcode will give you the suggest completions while typing Privacy - with the help of keyboard. Acquire has this feature called Co-browsing which is unique in its sense, as it allows an agent to browse the session with the customer so that he/she can get the desired product/services on their website to purchase. To use Cobrowse in your own app, you'll need to add our Native SDKs. We've made this as simple as possible, with just a few lines of code. Once the Native SDKs are added to your app, everything else is done through our web dashboard in any browser - no plugins or installs needed. 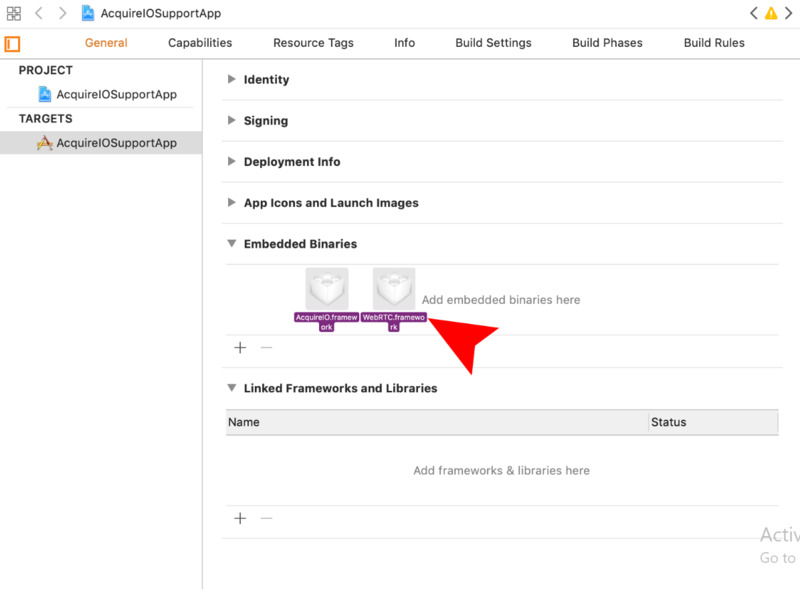 UIAppearance customisation are applied to AcquireIO SDK by default. However if there is a conflicting property, then the value in ThemeOptions key in AcquireIOConfig will take precedence. Enforce identity verification to prevent other from pretend to be (third party) for entertainment or fraud logged-in users.